For most, remarriage and having blended families brings unique estate planning challenges. These challenges can be further exacerbated when one spouse is significantly wealthier than the other. For example, Tom and Wendy are married. It’s a second marriage for both and they both have children from their first marriages. Wendy came to the marriage with a significantly larger estate than Tom. It’s important to Wendy that if she dies before Tom, that Wendy’s assets pass to her children, but she also wants to make sure that Tom is provided for. If Wendy just leaves her estate to Tom, it’s possible that he could spend it all or leave it to someone other than Wendy’s children. Before we can discuss the Lifetime QTIP as a planning strategy, it’s helpful to understand some estate tax planning basics for married couples. Each individual has their own “coupon”. For married couples, when the first spouse dies, a Credit Shelter Trust may be used to maximize use of the deceased spouse’s estate tax “coupon”. The surviving spouse and/or children or others can be the beneficiaries of the Credit Shelter Trust. When the surviving spouse dies, the assets of the Credit Shelter Trust, and any growth in value of those assets, continues to be sheltered from estate taxes. The estate tax laws also include an Unlimited Marital Deduction that allows an individual to leave an unlimited amount to a surviving spouse without owing any estate taxes (so long as the surviving spouse is a U.S. citizen). However, this is just a delay mechanism. When the surviving spouse dies, the assets will be included in the surviving spouse’s taxable estate. The surviving spouse’s estate tax “coupon” can be used to shelter some of the assets from estate taxes, but any assets above the “coupon” amount will be taxed. Assume that the estate tax exemption is $5M. If Wendy’s estimated estate is $8M and Tom’s is $500K, then Wendy could include a Credit Shelter Trust in her estate plan. If Wendy dies first, $5M of her estate would be allocated to the Credit Shelter Trust (the estate tax exemption, or ‘coupon’ for the sake of this example). Wendy still has to figure out what do to with her remaining $3M. The unlimited marital deduction would permit Wendy to leave the remaining $3M to Tom, but if Wendy leaves the $3M outright to Tom, he could spend it. Or, if Tom gets remarried, he could leave it to his new wife rather than to Wendy’s children. 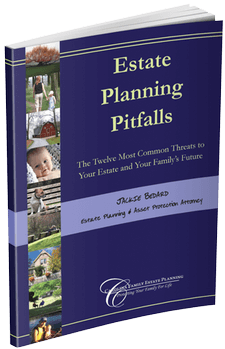 A common issue for blended families is wanting to maximize use of the estate tax exemption and unlimited marital deduction laws, but also wanting bloodline protection to ensure that upon the death of the surviving spouse, the assets passed to the first spouse’s children or beneficiaries as intended. As a result, the estate tax laws allow for what’s called a Qualified Terminable Interest Property (QTIP) trust which allows for use of the unlimited marital deduction while also having the assets held in trust for greater protection. Upon death of the first spouse, after allocating the estate tax exemption amount to the Credit Shelter Trust, the remaining assets pass to a QTIP Trust. The QTIP Trust must meet certain requirements in order to be eligible to the unlimited marital deduction. For example, the surviving spouse must be the sole beneficiary of the trust during the surviving spouse’s lifetime and the surviving spouse must have access to all of the net income of the QTIP Trust. You have the option to gift the surviving spouse access to some or all of the principal of the QTIP Trust, but it is not required. Once established after the death of the first spouse, the QTIP Trust must have its own taxpayer identification number and it must file its own income tax return. When the surviving spouse dies, the assets in the QTIP Trust will be countable as part of the surviving spouse’s estate for estate tax purposes, but the surviving spouse’s estate tax exemption can be used to shelter some or all of the QTIP assets from estate tax. When the surviving spouse dies, the QTIP Trust can stipulate who receives the remaining assets, such as the children of the first spouse to die. Wendy could set up her estate plan such that when she dies $5M passes to the Credit Shelter Trust and the remaining $3M passes to a QTIP for Tom. If Tom survives Wendy, he will receive the income from the assets in the QTIP Trust. When Tom dies, the assets remaining in the QTIP Trust can pass to Wendy’s children. Rather than waiting until death to fund a QTIP Trust, a Lifetime QTIP (i.e., a QTIP that you set up while you’re living) can be a great asset protection tool. This is referred to as a Lifetime QTIP Trust or Inter Vivos QTIP Trust. A Lifetime QTIP can provide asset protection for the assets in the trust while both spouses are living. The Lifetime QTIP trust can include a power to swap or “substitute” assets of equivalent value. This can allow for future planning flexibility to swap assets for stepped-up basis planning to reduce potential capital gains taxes. Transferring the assets to the Lifetime QTIP begins the 5-year lookback period for Medicaid eligibility for nursing home care. If the Trustmaker Spouse dies first, the Lifetime QTIP continues for the surviving spouse. If the Beneficiary Spouse dies first, the assets in the Lifetime QTIP can then flow into a lifetime trust for the benefit of the Trustmaker Spouse and will still be asset protected! Wendy could transfer $3M or more to a Lifetime QTIP. The assets in the trust would be protected if either Wendy or Tom are sued. While they are both living, Tom is beneficiary of the Lifetime QTIP. If Tom dies first, the assets flow into a new trust that Wendy is a beneficiary of and the assets are still protected if Wendy gets sued. Unfortunately, some individuals have a higher likelihood of being sued due to the nature of their professional or financial stature—in other words, those that have something to lose.